‘Burn wood not gas.’ That is the simple tagline of the BioLite CookStove, a camp-cooking product new this month that incorporates a small fan to perpetuate a hot-burning fire. You start a fire in the metal case then drop sticks and shaved wood inside. Supporting legs and a wide-lip top provide structure to boil water or cook with a pot on top. 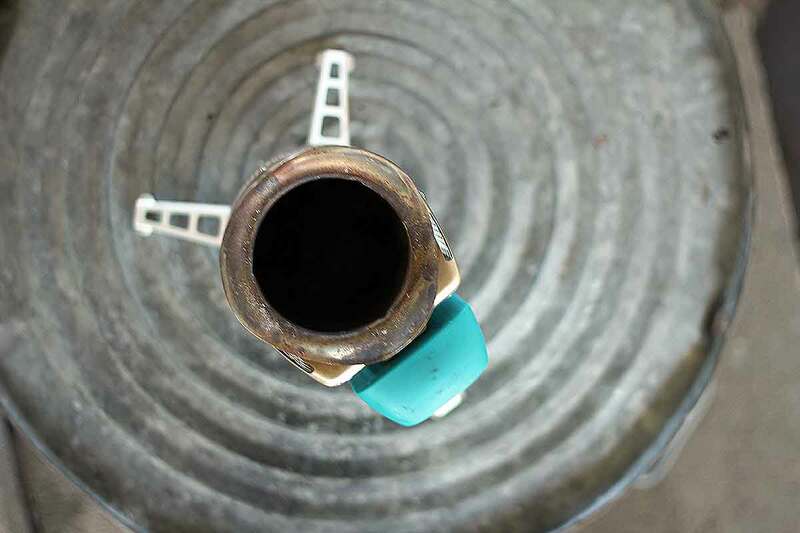 Based off the principle of a rocket stove, the BioLite concentrates its combustion in a cylindrical cavern and then circulates air via a small rechargeable fan to invigorate the flame. I tested it this week for the first time with success, heating a liter of water to boil in just over five minutes once the flames were stoked. 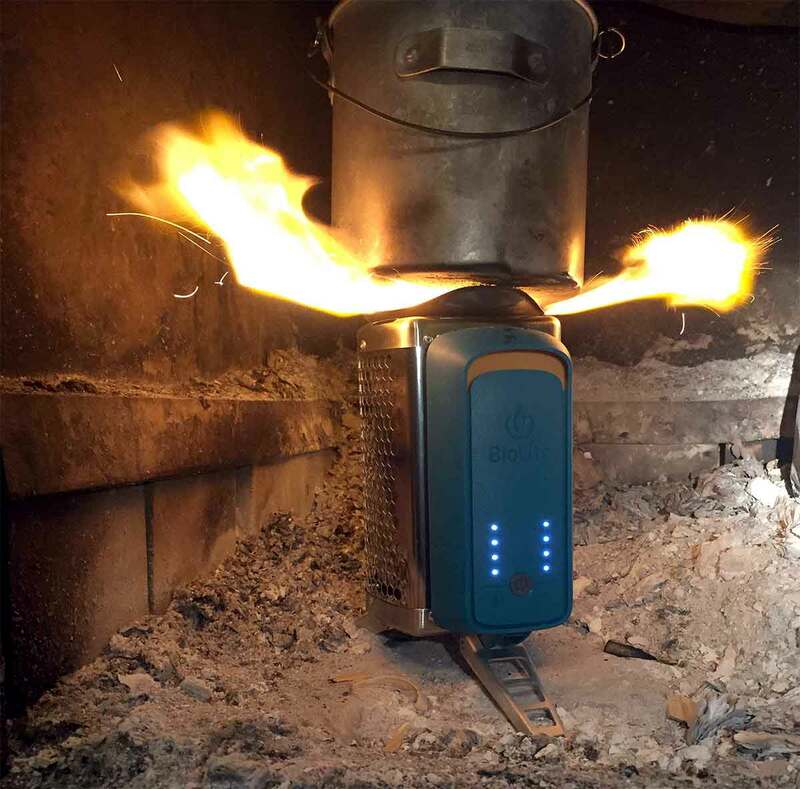 BioLite is best known for its electricity-generating stoves, where heat from a fire creates usable power to plug in and recharge devices. This unit, the CookStove, is more simple, with its clip-on fan featuring just one button and tiny LEDs. On a backpacking trip you can leave the fuel gas canisters behind. This stove runs on the detritus of the forest, including pine cones, grass, and small sticks. It’s a hungry beast once running, however, with its swirling flame engulfing found fuel in seconds if dry. In my boiling test, using pencil-thin wood, the CookStove ate twigs like no tomorrow. I was forced to refuel the caldron three times before my liter of water hit 212 degrees. You get four levels of fan output, with each press of the button ratcheting up the air. 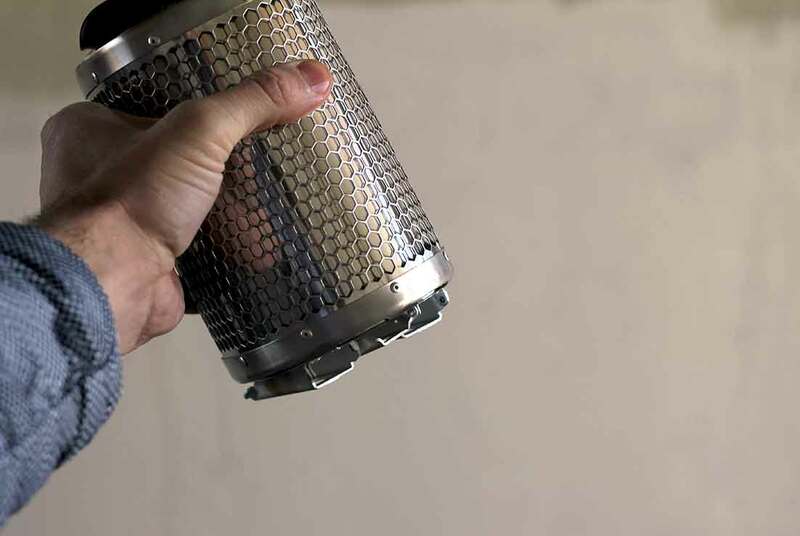 I ran it at “high” most of the time, and the result was a literal tornado of flame — once in motion the CookStove functions like an air-fed rocket stove in its optimal state, burning hot and producing almost no smoke. “The smoke you see from a typical campfire? 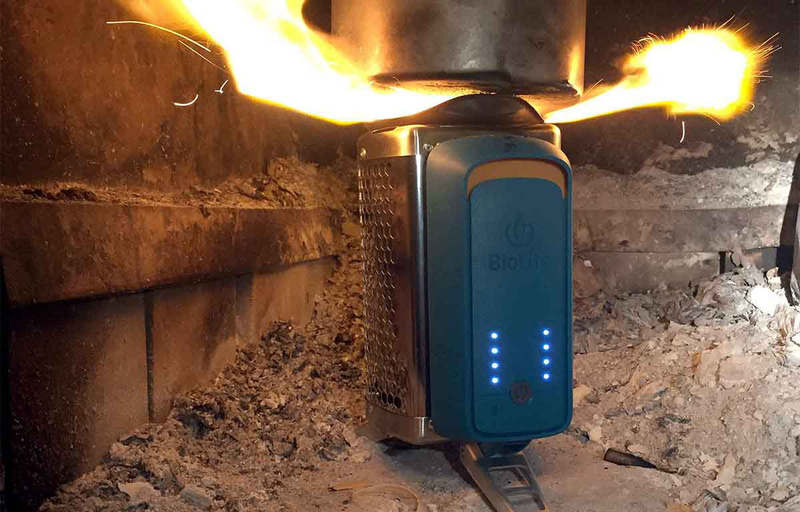 That’s wasted fuel,” BioLite notes in its promotion of the CookStove. The company leans on efficiency as well as no reliance on fossil fuel for this unit. Air is pumped into the burn chamber via multiple “jets.” For any reasonable backpacking trip you should be able to get by on a single charge. The fan battery lasts for hours, and if needed, it’s rechargeable via solar or other means in the field. Overall, I love the stove in concept, and in function it’s pretty great, too. It’s certainly heavier and bulkier than my most minimal backpacking burners, at about 8 inches tall and 1.6 pounds. But remember that with the BioLite you can leave the fuel canisters at home, thus saving some space and a little weight. You do need to forage for good, dry wood once out there. I tried burning just slightly “green” sticks and the stove barely worked. But for dry fuel its appetite, as noted, is tremendous. Have a small pile of finger-thick wood at the ready when it’s time to cook. Once roaring you can drop in bigger pieces of wood. They burn longer, though not as clean, as the smaller bits. But the larger hunks take some of the babysitting away if you’re boiling water before a meal. 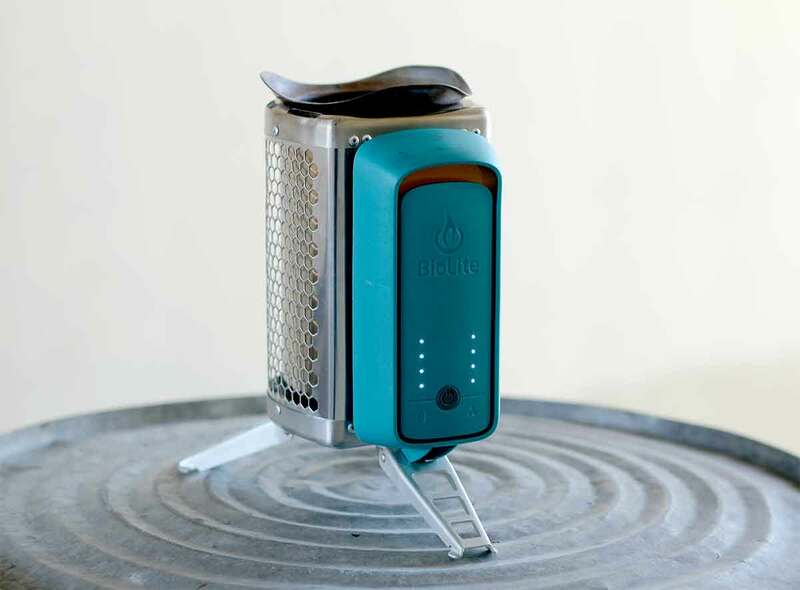 BioLite has built a quality camp-cooking solution with the CookStove. Don’t rely on this unit if you need to melt snow or feed big groups. But for a couple or small family on the trail, the CookStove is a solid option and a new way to approach the age-old need for flame.